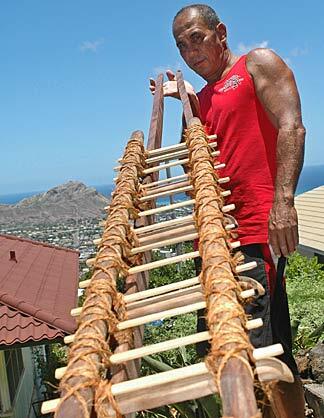 Tom "Pohaku" Stone inspects a Hawaiian sled that he built in Honolulu. As a boy growing up in a poor family on the Big Island, Tom "Pohaku" Stone found entertainment barreling down grassy slopes aboard ti leafs and banana stumps. But for Stone, what began as childhood fun on a natural roller coaster ride has evolved into an academic and cultural journey aimed at reviving the 2,000-year Hawaiian tradition of he'e holua, or Hawaiian lava sledding. He has the scars to show for it. Wearing just a tank top and shorts and reaching speeds of up to 70 mph on a sled standing only four inches above ground, Stone once ran into a steel post sticking up from the grass during a demonstration in a slope on Maui, tearing an 18-inch gash in his left thigh. In another crash, Stone broke his neck. It hasn't stopped him. "You can't even imagine what it's like to be head first, four inches off the ground, doing 30, 40, 50 miles an hour on rock," Stone said. "It looks like you are riding just fluid lava. It's death-defying ... but it's a lot of fun." It wasn't quite as dangerous when Stone was a kid. "You would break off a bunch of ti leaves, sit down on it and skid down the mountain all covered in mud," said Stone, now a 54-year-old community college professor who teaches the ancient Hawaiian sport and gives classes on sled building and riding. "That just became my cultural passion because of the similarities with surfing, but it also became my academic passion." 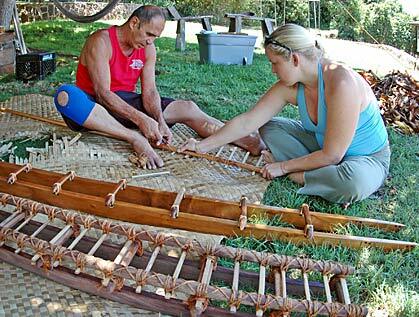 Tom "Pohaku" Stone, left, and his wife, Anne, work together on a Hawaiian sled. It takes about two weeks, or 24 hours of nonstop work, to finish a sled. Traditionally, he'e holua served both as a sport and as a vehicle for native Hawaiians to honor their gods, especially Pele, the goddess of fire. After reaching the top of a slope, Hawaiians would stand up, lie down, or kneel atop hardwood sleds -- often carved from Kauila or Ohia and measuring 12 feet long by 6 inches wide -- and speed down the man-made courses of hardened lava rocks sprinkled with grass. But missionaries who brought Christianity to Hawaii saw the sport as "a frivolous waste of time," Stone said, and its practice ended in 1825, when the last he'e holua racing event was documented. "They wanted us to work, stop being happy," Stone said. Stone first heard about the practice, which also took place in other islands in the Pacific such as Tahiti and New Zealand, through stories told by his grandfather. His interest in reviving the sport came in 1993, when he wrote a term paper on the tradition for a college class. A year later he had built his first sled and soon he began teaching people how to ride and craft the sleds, which are hand lashed with coconut fiber and weigh between 40 and 60 pounds. It takes Stone about two weeks, or 24 hours of nonstop work, to finish a sled, and his prices start at $3,000. He is currently carving a sled for an exposition and another for a restaurant in Kona. Stone said his solid wood sleds "last forever," unlike today's snowboards and surfboards built on more high-tech, yet less durable materials like fiberglass and foam. For example, the Bishop Museum, the state's largest museum, has an 800-year-old sled on display, he said. A retired lifeguard and champion surfer, Stone has discovered some 57 rock slides of various lengths across the state, and spent three days with a crew of seven to make a 200-foot repair on a 700-foot course. The only remaining course on Oahu is at Kaena Point, he said, and only two courses are in rideable conditions, both on the Big Island. Stone said there are only about a couple dozen regular riders, and he is unaware of any deaths or serious injuries among those trying the sport. Clifford "Pake" Ah Mow got hooked on the sport three years ago as he sped down a trail on the Big Island. "It's great, unbelievable," said Ah Mow, a lifeguard who patrols Oahu's east and south shores and has sustained "little bumps and bruises" while sledding. "You get the chills." The upkeep of centuries-old courses and hand carving the sleds from scratch are only some of the sport's challenges. By the end of 2005, Stone wants to complete a mile-long rock slide on the Big Island and hold the first he'e holua event there in more than 100 years. He said the biggest challenge is to find a sponsor who would be willing to back the dangerous event, whose judging criteria will include "style, length of ride, and survival ability." Stone said safety measures like nearby medical care centers are being considered for the tournament the same way Jet Skis assist surfers who run into danger while competing in big waves. "There's people across the world that want to ride," he said. "Once you do it, you never look back. You want to do it all the time."